It doesn’t seem that any of the Windows 7 patches address the Total Meltdown vulnerability introduced in all the 2018 patches so far. Guess I’ll just stay patched through December 2017 and wait for further developments. I believe Total Meltdown was addressed for Win7 in KB 4100480 offered through Windows Update and available for download from the MD Catalog. Indeed, but what we need to know in due course is whether the April rollup includes that fix for Total Meltdown or simply maintains the same vulnerability as the January, February and March rollups. I’ve been waiting to see what happens on this point, but if there is still a vulnerability in the April rollup then I do intend to install the fix through KB4100480 and, once approved, I’ll install the April rollup itself. Is it necessary in those circumstances also to install KB4099950? I’ve rather lost track of what that particular update is for! KB 4099950 fixes the problem with fixed IP addresses disappearing from NICs and NIC configuration being lost. Yes, it should be installed. Thanks PK, but do I assume that the fixed IP problem derives from the March rollup, so if that hasn’t been installed, whether it is still needed presumably depends on the situation with the April rollup? Given that all updates come with significant risks these days, it’s important that we only install those that are absolutely necessary given what else we are installing. Installing updates that provide fixes for problems we don’t have because we didn’t install the updates that created them is likely to cause its own problems! 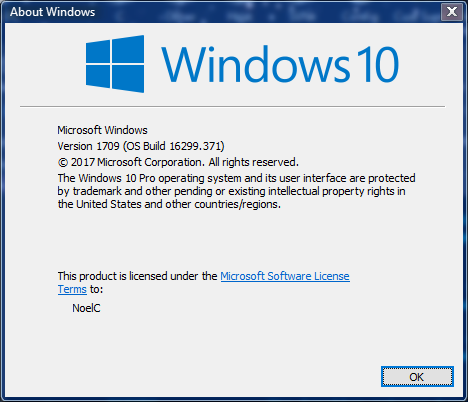 I have not installed the March cumulative update, the last updates I installed are the February cumulative update plus KB4100480. Today I get offered both KB4099950 and the April cumulative update. I therefore assume that KB4099950 has not been included in the April cumulative update. I’ve installed the middle two patches before seeing your post. Is it too late to install the first and last patches in your order? I only have one laptop not connected to a network. Thanks for your help! So, yes meaning it’s too late to install kb4099950 and kb4096040 if you have already installed kb4088878 and kb4096040 ? Does that mean my machine is vulnerable? Sorry. I meant yes, you should install kb4099950. If you are not having a problem with IE11 failing to starting, you may not need kb4096040, but it won’t hurt anything to install it if you want to cover all bases. If it’s unchecked, don’t install it. I’m definitely confused… I thought KB4100480 was only useful if I’d applied any patches since December, which I have not done… And do I need to apply any of the 2018 patches for Windows 7 before installing KB4100480? Does anyone know for sure? You don’t have the Total Meltdown vulnerability – it was a result of installing Jan, Feb, and Mar patches. KB 40100480 was the fix AFTER applying those patches. Correct. KB4100480 is the fix for Total Meltdown which is CVE-2018-1038 which was reported by Ulf Frisk. Thanks, but, without doubting you, do you have a link to where that has been officially stated please? And here I go again: Office 2007 received updates again, for the 6th consecutive month after it was officially declared EOL in October 2017. As usual I gave an immediate try install to KB4093118 (Monthly Rollup) for win7. which is literally same as it was of KB4089187 included into KB4088875 March rollup. 2. There is a sense to install KB4099950 – 29KB registry patch concerning this key HKEY_LOCAL_MACHINE\SYSTEM\CurrentControlSet\Enum\PCI marked as Recommended before KB4093118, otherwise it’s remaining uninstall in offering list. I’ll duly prompt further testing results. I’ve anyway changed above key value to 3 and then done a clean install of same version (not latest but assumed best) of nVidia driver but this time including its integrated PhysX performance component. And it seems resolved both issues. Anyhow, I’ll duly prompt here further issues if any. Meanwhile I assume this April rollup as more or less acceptable for a permanent deployment. 2. Replaced a nVidia driver to even older one but released by m$ itself. Sorry, my optimistic guess regarding April full rollup KB4093118 was wrong. Same 2 issues again. Mainly – The Desktop Window Manager has encountered a fatal error (0x8898009b). Chaotic. A culprit remains unclear but when rollup removed both issues vanished immediately. 1. KB4093118 removed & put to hidden list so win7 is now back to a massive patching status of Dec2017 full rollup KB4054518. 2. KB4099950 29kb registry patch remains installed w/o any network issues both before its installation and afterwards. 3. IE11 patch KB4092946 v11.0.9600.18977 build 11.0.56 installed as standalone and performs normally except that odd stuff in its build numbering when previous IE11 patch KB4096040 of late March was v11.0.9600.18954 build 11.0.57! Meanwhile I’ve installed April 10, 2018—KB4093108 (Security-only update) only for testing purpose aimed to narrow search for a culprit of both issues occurred if any of 2018 massive patches installed and got a funny result – there is no any sign of both issues with any value of win7 registry key of enabling/disabling Spectre and/or Meltdown protection as 0-1-2-3. Thus these issues aren’t related to security but to some of win7 new features introduced in 2018 massive patches. As I posted elsewhere, I got the BSOD today so I uninstalled KB4088875 and KB4099467. I am Group A and have windows 7 64bit. I have Jan and Feb rollup installed. I have KB41000480 and KB4099950 installed. Should I keep KB4099950 installed? I’m feeling deja- vu all over again! Hi — that drove me crazy yesterday because when I read the post I was sure it was you and then I saw Anonymous — too funny! I’m glad you are happily patched. I believe that MrBrian also shared that he also did not install KB4099467 and he did not get the BSOD. It was intermittent with me. Windows7 Professional SP1 Intel (R) Core (TM) 64-bit Lenovo desktop. Mind you, I’m not complaining, I’m just confused. Why does Office 2007 get patches while Vista, XP, 2003 do not? I just don’t understand. I’m not surprised that Microsoft postponed 1803. The update servers will be hammered this week. Pulling down gigabytes 1803 won’t help. Better to do a staggered release. Of course, the possibility exists of a show-stopper bug, but that’s par for the course. Windows 2003 is a cash cow for Microsoft. This OS still gets updates, but it all comes at a price for the large enterprises not migrated yet. Probably not so critical as they sound, but useful nevertheless, especially that many of those enterprises paying for support are potentially prime targets for malware and attacks. There may still be vulnerabilities in all versions of Office which require patching for the sanity of the Internet very much like the out-of-band XP patch of few months ago and this takes precedence over short term financial gains like in the case of Windows 2003. I haven’t installed the March updates yet, but did install just the 4100480. Do I need to re-install that after installing the March Security updates? (Group B), since those apparently introduce the hole also? As in will those override the fix. You need to install KB 4099950 from Windows Update. You should also read this topic about the March patches – some have to be installed in a certain order. Any word on whether Microsoft fixed the Total Meltdown silliness? I have not installed KB4099950 because it came out after the March rollup got installed. KB4099950 was sent by windows update and it is still unchecked, on my W7 x64. – Is that why it is unchecked, because it is a prerequisite to the March update, which I have already installed? If I leave the March rollup as is and install KB4099950 before the April monthly rollup, will the script make the changes it is designed to make, or do nothing? As I have had no problems with any of the bugs in the March rollup, including the network problems, I am thinking I can hide KB4099950. However, I am unsure if there will be a price to pay down the road if I do this. Win 7, 64 bit non techie Group A here. Last week I installed KB41000480 and KB4099950. The March roll-up was never offered and I would not have installed it even if it had been. I’ve seen some discussion about KB4099467, which I have never been offered either. Today, I was offered the April roll-up (which I will hold off on until Woody gives the ok) but not offered KB4099467 again. Is KB4099467 something that I should be installing? Thanks for all the help and guidance! KB4099467 I believe is only available from the Windows Update Catalog and is supposed to fix the BSOD problem. However, there is a tricky installation for it: First install KB99950. Then install KB4088875 but you must “reboot later” by clicking “cancel” before the computer reboots. Then you go to the Update Catalog and download KB4099467 and then reboot. I don’t believe I was able to perform this correctly. My previous answer only applied to the March rollup (I’m Group A). From what I’m reading KB4099467 will be included in the April rollup and we will not have to do the intricate installation that I was referring to. Ahhh, the KB2952664 update for Win7 SP1 and KB2976978 update for Win8.1 have a new date (4/8/2018) listed on MS Update Catalog. WU is offering these updates again today thru recent WU scans on my Win7/8.1 machines – rated as Important but not checked. by the way, I went ahead and installed the KB4093118 update on my family’s Dell Inspiron 620 computer running Win7 and have found no problems so far. seems like MS did make amends with this April 2018 update. Others should wait for either woody or susan to give the okay for the april 2018 updates if there are unforseen problems. Ahhh, the KB2952664 update for Win7 SP1 and KB2976978 update for Win8.1 have a new date (4/8/2018) listed on MS Update Catalog. WU is offering these updates again today thru recent WU scans on my Win7/8.1 machines – rated as Important but not checked. Same here. In addition to the April Rollup for Windows 7 (KB4093118), Windows Update once again offered me infamous snooping patch (KB2952664). I hid that immediately. Are microsoft still peddling the lie that win 10 is the most secure windows? From where i’m sitting it looks like another patching month has arrived with the most number of vulnerabilities going to the aforementioned. At the moment i’m more inclined to never install march security-only due to the many unknowns. It was never even offered to me in update and you had to go through a labyrinthine effort just to get it to show up so no, i might leave well alone and accept the risks. The phrase “most secure” is meaningless and unprovable, not even accounting for there being no measure of benefit tied to it. Thinking in the extreme, a computer that’s powered-off is really quite secure, you have to admit – but it is also useless. I’ve noticed that Microsoft occasionally makes statements about data it has received from its own telemetry, selecting months where there have been fewer reports of certain malware found on Windows 10 than some other versions and claiming a “win” for Windows 10, even though the tables turn in subsequent months. I’m not sure what statistics they could even be using to determine a “security” level… Are there exploits or infections that get by Windows Defender but which somehow get reported? Wouldn’t a system that successfully detects and blocks malware – and reports that in – actually be considered secure? Do they count systems that were almost infected? For me it all starts to fail a “sniff test”. Like so many others, I’m done with Windows 10 now. I couldn’t stand the forced build upgrades and the compatibility issues they brought with them, so I managed to get hold of a copy of LTSB from work. I used it for a couple of months and it was tolerable. Until in the last few days… it forced on a Synaptics touchpad driver that for some reason causes my left touchpad button to double-click instead of single click when only briefly pressed. (HP’s own Synaptics driver works fine.) This was despite the fact I had the GPO enabled to exclude drivers from Windows Update and also had the driver hidden via wushowhide.diagcab. In fact, I wasn’t even able to hide the update again yesterday because it was already hidden previously. So, this evening, it managed to get the driver on. And I promptly restored a Windows 8.1 backup image I had. That’s it for me. I’ve used every version of Windows since 3.00a and even Vista didn’t infuriate me as much as 10 does. It makes me sad to think that this is most likely the end of the line for me with Windows. 1. KB4093118 and KB4093108 contain v6.1.7601.24094 of files ntoskrnl.exe and ntkrnlpa.exe, which is newer than the v6.1.7601.24093 files ntoskrnl.exe and ntkrnlpa.exe contained in the Total Meltdown fix KB4100480. (My analysis of KB4100480.) Thus, KB4093118 and KB4093108 very likely fix Total Meltdown without needing to install KB4100480. 2. KB4093118 and KB4093108 contain v6.1.7601.24093 of file win32k.sys, which is newer than the v6.1.7601.24061 file win32k.sys contained in KB4099467. (abbodi86’s analysis of KB4099467.) Thus, KB4093118 and KB4093108 very likely fix the same issue fixed by KB4099467 without needing to install KB4099467. Decided to take the point this time for April. I turned off scr and put VShield into install mode, but left NVT OSA and MSE running. I ran OS KB4093108 1st and IE KB4092946 next. Each asked for restart, which I did. Also checked event viewer, services, and devices after both restarts … no problems. So, mission complete. I just made an image two days ago and thought it was my turn to test. Most should wait for a good Defcon though. I might just be lucky. I have a test 2012 R2 Server on which kb4093114 (April Rollup) is failing to install. Is anyone else seeing an install problem with this rollup? @gkarasik: Thank you for the heads-up. Hopefully someone with 2012 R2 Server will be along soon to assist you or confirm the issue. Lifted blocking of updates via Windows Update and WSUS if “antivirus compatibility” Registry key was not set. Windows app platform and frameworks. ActiveX printing issue in IE. SVG rendering issue causing high load issue in IE. Custom controls identifying issue in IE. Asking for some confirmation here. Installing 4099467 (logoff BSOD fix) should not hurt anything, but is probably not necessary as @mrbrian says it is contained in 4093108 (April security-only). However, Windows Update is “smart” enough not to overwrite later versions of files with earlier ones. I have always installed the IE11 Cumulative Update after the security patch, in your case, last. That order looks right to me. KB4099467 shouldn’t be needed because you’re installing KB4093108, but be sure to not reboot in between installing KB4088878 and KB4093108. It shouldn’t be harmful to install KB4099467 if you want to though, but be sure to not reboot in between installing KB4088878 and KB4099467. @pkcano: I always installed the IE patch before the security-only one, didn’t seem to hurt anything so far. The restrictions apparently haven’t been lifted for those updates for which they have already been applied to. I just did a test in Windows x64 using Windows Update MiniTool with “Include superseded” ticked. Without the QualityCompat registry item, there were 302 applicable updates. With the QualityCompat registry item, there were 311 applicable updates. I confirmed that KB4093118 contains file PCIClearStaleCache.exe, which KB4099950 also contains. KB4093108 does not contain PCIClearStaleCache.exe. Thus, it appears that Group B should apply KB4099950 before installing KB4088878. I didn’t install 4099950 before 4088878 due to error. I’m not having any network issues. Should I install 4099950 now? Would there be any problems or should I ignore it and continue onwards in Group B without it. Thanks for input. I think you should still install KB4099950. Thank you MrBrian. I will install before April’s SO and IE updates when DefCon rating changes. Not sure what’s wrong with updates for Windows 10 Pro 1709 and Windows 8.1/Server 2012 R2 this month, but it took ages to install and restart (3 times longer than usual). Best of all, after restart, Windows was complaining about Windows activation on some Windows 10 boxes and it took a few more restarts until Windows finally figured that Windows 10 Pro is properly licensed. Wonder what expert approved the updates. Well, Microsoft — the patchwork company..
April Security Only Windows 7 64 bit patches probably cleans up some of the mess from the Meltdown Spectre patches. Some fixes and kernel reliability improvements sounds like it will be worth installing when Woody gives the green light. Maybe next month I might consider Group W. How to get off this update treadmill and still feel secure. Damned if I do yet damned if I don’t. KB4093118 for Windows 7 installed on two systems. Both systems rebooted without error. I installed the 1709 update on my personal laptop last night and my laptop didn’t crash! Amazing! Did not see any errors and laptop seems fine. Can anyone conform whether or not these three are included in KB4093118? @abbodi86 and @mrbrian have confirmed that KB 4099950 (NIC/IP-fix).KB 4099467 (Stop error 0xAB), and KB 4100480 (Total Meltdown) are in KB4093118. See their comments earlier in this thread. I have not seen information on the KB 4096040 (IE11-fix). Now it is clear that KB4099950, while included in the 2018-04 Monthly Update, most if not all of the times is missed due to a bug in the bundling mechanism. The better option is to install it manually or from WU when offered, regardless of the order. It fixed issues with 2018-03 Monthly update, it fixes issues with 2018-04 update and will likely fix issues at any time in the future. It is not a core patch as such and it can be skipped by a large majority of users, but it fixes an issue for the remainder of users, which are more likely to be enterprise users who use virtualisation in specific ways. KB3125574 includes an equivalent update as far as I know and may be a better alternative for those affected by this issue. There is much more attention than it is necessary given to this patch. KB4093118 doesn’t list the Internet Explorer issue that KB4096040 fixed. Also, the fix included in KB4096040 was already included in KB4088881 according to Microsoft. I just checked Brian Krebs comments section on KB4093118 reviews. Two people who installed it on Windows 7 Professional computers now can’t access the computer getting message on Startup “user profile not found.” Then underneath it says okay — they click okay and it logs off. Then it comes back and the same thing happens. Anyone else aware of this? Can anyone explain wat 4B and 3B stand for? Yep – just came to post that email myself. They recommend people download the full MSU from the Update Catalog because WU and WSUS are broken. MS gets dumber by the day, I swear. 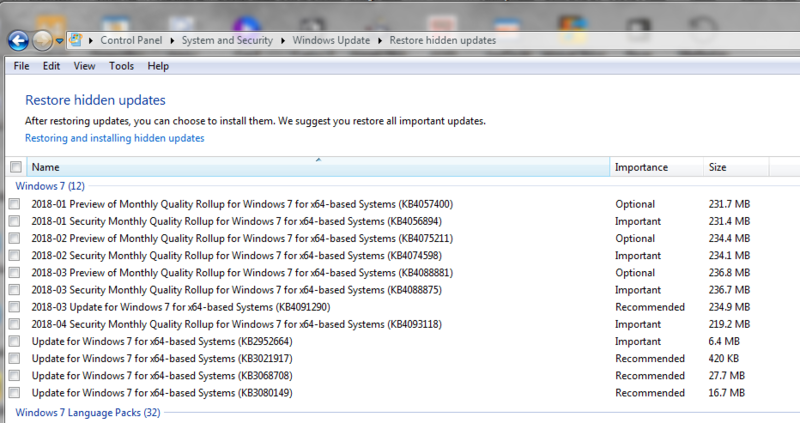 Windows 7 Professional 64 bit Group A — I’ve got Jan. & Feb rollups installed plus KB4100480 and KB4099950. Question: should I uninstall KB4099950 and re-install it from the Catalog? Speaking of 950. I didn`t download it yet. I just had it sitting there. Today with the April patch 950 disappeared from my WU. I took a lot longer than usual for my pc to get ready, and as I expected it was because of my AV. Its log showed that it had prevented an unauthorized connection attempt by conhost.exe, that a new firewall rule had been made for Outgoing UDP Ports 137 and 138 and that firewall rules has been updated Furthermore a new shortlink of the AV had appeared on my desktop (which only occurs when the engine is updated). So my guess is, that [something] is coordinated between MS and the AV. Can anyone here clarify what’s going on? So far, everything seems to work just fine. I would roll back ASAP! In all seriousness, I believe my experience helps prove the efficacy of a “wait to update to version X until version Y’s release is imminent” strategy with regard to Windows 10 – presuming you want to use the Pro edition for real work. Things get remarkably trouble-free 6 months or more after release. 1. Keep your hardware on the older version of the OS, and evaluate a new Win 10 release in a throwaway virtual machine when it first comes out, presuming you’re curious about new features, etc. 2. Continue running your hardware on the older system, and download the ISO for the latest version when the OS is moved to the “Semi-Annual Channel”. Upgrade a VM directly from the older version using that ISO and begin to seriously evaluate it for fitness for purpose. 3. At around the time the next major version is about to be released to the unpaid beta testing public, upgrade your hardware system from the ISO you downloaded (in step 2, roughly 3 months prior), then update it immediately to the latest patch level. The only thing we might hope for that would be better than this would be an ISO from Microsoft containing all the latest patches at the time of step 3, but that’s not likely to be provided. computers now can’t access the computer getting message on Startup “user profile not found.” Then underneath it says okay — they click okay and it logs off. Then it comes back and the same thing happens. Anyone else aware of this? I had this on April 6 at 12.34AM EDT. At that point I had NOT installed the March Security only KB4088878, KB4099950, KB4099467, or KB4100480. Multiple attempts at reboot did not fix it. The only updates had been installed in the past 2 weeks had been the daily MSE definition updates with the last being 1.265.111.0 on April 5 at 5.52PM EDT, and a Steam update after that on April 5. I discovered the issue whan I returned to the PC after dinner and an errand and found the internet connection was broken. I rebooted the cable modem, but it did not help. I then shut down and again rebooted the cable modem. Upon reboot I discovered the problem. I was able to get into startup repair mode and it was not successful and initiated a system restore to the previous day. It was successful and I was able to log-in. I checked Malwarebytes Premium and MSE for any detections or quarantines and nothing. I did a full scan with MSE, and initiated Chameleon scans with MWB, all negative. I also checked both the installed updates and the WU history and neither shows any activities except the MSE definitions. I then did a total backup of all my data. I checked the Windows logs and found a number of error events: 1502, 1508, 1515, 1511, 1500. As this is not a diagnostic section, I have not posted verbose descriptions. April Security Only Windows 7 64 bit patches probably cleans up some of the mess from the Meltdown Spectre patches. Some fixes and kernel reliability improvements sounds like it will be worth installing when Woody gives the green light. Maybe next month I might consider Group W. How to get off this update treadmill and still feel secure. Damned if I do yet damned if I don’t. AN answer — if you’re really up to it — is to do some serious hardening of your Win 7 system and employ a multi-layered defense. Best place for advice and expertise I’m aware of –other sources appreciated– it is at MalwareTips forums; this post will get you started. Although Application Whitelisting & a Software Restriction Policy are at the top of the list, there’s one thing even more important: developing a regular routine of system imaging and data backup. I always image my system before & after I install Win Updates… or any program that hooks deeply into the OS. BSOD “PAGE_FAULT_IN_NONPAGED_AREA” when installing Windows 10 v1709 KB4093112 (error 0x800f0845). and “Method 1” from the link. Basically, use regedit to locate folder in ProfileList and rename the *bak file. It was my first time and it really was not that bad. For me, it happened after MSE update because I had not installed any Win7 updates at that time. I am in group B, and I have updated all 3 machines to March updates Monday. I’m wondering if this statement is still true??? If @abbodi86 says it, it is true. I GIVE UP! Group B, on top of the Total Meltdown saga, is overwhelmingly confusing! When Woody gives the word, I want to join Group A. Can I do so by “simply” installing the Monthly Quality Rollup and whatever else WU offers? I’m current thru FEB 2018 Security only. NO March updates installed. As of today (4/11) WU is offering me only the FEB Quality Rollup (4074598) along with 4100480 and 2952664. Advice will be greatly appreciated! I understand the March rollup has been withdrawn because it had so many issues. But beware of the assumption that joining ‘Group A’ will make life easier – see #183616 above. It’s guerilla warfare we’re in now! Yes. For more info see 2000011: Group A, Group B and Group W – what’s the difference? I’m seeing something curious on my Win7 SP1 64-bit Home Premium laptop. I’m Group A and installed only KB4100480 and KB4099950. On Monday the March Rollup KB4088875 was sitting in Windows Update, unchecked. I didn’t install it. I have WU set to check but let me choose etc. Yesterday, on Patch Tuesday, I was offered the April Rollup, checked, and the March Rollup no longer appeared, as expected. The same was true this morning. I noticed that KB2952664 had reappeared today so I hid it once again. Later I shut down for several hours. This afternoon when I turned the computer back on and Windows Update checked for updates, the April Rollup disappeared and the March Rollup is back again, unchecked. Of course, I won’t be installing the April Rollup until Defcon 3 anyway, but has this happened to anyone else? Since I, too, have a Win7 SP1 64-bit Home Premium laptop, I was curious as to what Windows Update would bring me today. I am a Group B updater, and have Windows Update set to never check, and am updated through December 2017. Yesterday I was offered, and hid, the April Rollup. Last month, on Patch Tuesday, I had been offered, and hid March’s Rollup. I unhid it, to test for something, a few days later, and it disappeared, never to show up, checked or unchecked again. The April Rollup is still in the Update Catalog, but I’m thinking it was, or is in the process of, being pulled? No question that it it can be mighty confusing to follow the twists and turns caused by Microsoft’s patching incompetence. But once you sit down to carry out the monthly patching using the guidance given at Woody’s, you may find that it’s not nearly as complicated as it seems. That was my experience of it, anyway. To keep things simple, and Group B viable for you, you can ignore the ongoing back-and-forth of botched updates, withdrawn patches, and patches to patches, and just wait for Woody to reset the MS-DEFCON level to 3. That will probably be a few days before the May patches are due out. Since you are updated through February, just follow Woody’s and PKCano’s patching guidance for March 2018. I’m in Group B, and I installed the March patches over the weekend. I was relieved to find that it wasn’t as hard as all the ongoing drama would suggest. Take your usual precautions before updating (at least set a restore point, and preferably also do a system backup), and then do it. Good luck. @KWGuy, I think @Cybertooth offers good advice (providing you’re still willing to stay in Group B). If it will help at all, here are the steps I took to update through March. Like you, I had been updated through February: #182757. I also do not pay much attention until Woody gives the go-ahead with DEFCON 3 (or higher) for the next month’s updates . . .
Hi, I’m W7 group A and following Woody’s advice, I didn’t install any of the March updates. I will wait for Woody’s April instructions, but i already have a question : I’ve always only used WU; if you download a patch from the catalog, is it applied automatically, does it go into WU,… ? This is my first registered post; I’m from France, so sorry for my poor English. And thanks again for all you do. @frwin – When you download the patch, save it on your computer. It will either be a file or a file inside a folder. If it’s a file, just double click and follow the directions – usually all you do is click a few buttons – and it will install. When it’s done you typically will get a window asking if you want to restart now or wait. If no restart is required it will say so. If it’s a folder, open the folder, then double click the file you see and proceed as just described. Basically it’s just like installing a small program. You’ll get the hang of it during your first try. PS – Welcome to AskWoody, and, there’s nothing wrong with your English – it’s excellent. So maybe it’s just me, but on my work computer (Windows 7 Pro, domain joined) and my home computer (Windows 7 Pro, standalone), I checked for updates yesterday and discovered they both had the Windows 7 2018-04 security update available as Important. Today, I checked for updates this afternoon, and both the work computer and my home computer no longer have the update listed. It’s gone. Did it get pulled? I don’t know if it got pulled or not. Last I checked, it was still offered in the Update Catalog. Not just you. I think it has been pulled. Not offered to my 2 Win7 64bit laptops today and the preview KB4088881 is still there. I’m the anonymous from #183754. Just checked my Windows 7 Pro machine at home, and the 2018-04 (KB4093118) update has returned (Thursday evening). Not touching it until next week haha; want to see if it gets pulled again. Had done a windows update check yesterday. KB4093118 was offered and checked. This morning, it is still being offered but now unchecked. After reading here this morning, I’m figuring that MS doesn’t want me to install April’s rollup through WU but rather go to the catalog? Of course not installing anything until we get the green light here. My computer remains rolled back to December without applying any patches at all. KB4091290 and KB4099950 were/are still in my hidden list. Has KB4093118 been pulled altogether? Just run WU on 2 Win7 64bit laptops and it is not there checked or unchecked and preview KB4088881 still being offered unchecked. Testing on my Windows 7 x64 virtual machine has revealed that KB4093118 has unusual behavior in regards to whether it is listed or not in Windows Update. Using Windows Update MiniTool with “Include superseded” ticked, KB4093118 is listed. Using Windows Update MiniTool with “Include superseded” unticked, KB4093118 is not listed. Usually this would mean that KB4093118 isn’t listed in Windows Update because it’s metadata-superseded by other listed update(s). But the metadata for KB4093118 for Windows 7 x64 shows that there are no updates that metadata-supersede KB4093118 for Windows 7 x64. I suspect that KB4093118 has update attribute supersedenceBehavior=1, just like KB4088875 does. So do you think because I have those 2 updates hidden KB4091290 and KB4099950 is why KB4093118 is unchecked now? That they may be prerequisite to the April Rollup? I’m working on this now. I’ll post later in this topic when/if I have an answer. Has anyone noticed that KB4093118 is no longer offered when it was yesterday? I have 4 Win 7 64 machines and all 4 had this pending yesterday. I installed it on one and all was well. This morning it is no longer offered on the other 3. Yes, I had the same experience. I was offered the April Rollup for one day, starting on Patch Tuesday. On Wednesday afternoon after WU checked for updates, it was gone and the March Rollup was back, unchecked on my Win7 Home Premium SP1 64-bit laptop. I had installed only KB4100480 and KB4099950 before the April Patch Tuesday. I have hidden KB4091290. See MrBrian’s posts at #184057 and 184064. I had installed KB4099950 and KB4100480 and have no updates hidden. Was offered 4093118 and then not offered it so I am not sure this has anything to do with having updates hidden, for me anyway. This whole thing is a mess. If I did not need Windows for a few things I would dump it. I already run Linux Mint 18.3 and for 90% of what I do, it’s just fine. KB4093118 is listed in my Win 7 64 list again but unchecked-was checked yesterday. Install or not, and has anyone had any problems with it? Hide KB4093118 and do not install it… yet. The alert is at DEFCON-2 and the patch keeps changing. Just a followup on the off-chance anyone else ran into this–looking in the log (%windir%\windowsupdate.log), I saw several references to WSUS-related failures and warnings. I didn’t have WSUS installed, so I installed it. The update succeeded. I won’t attempt to make any sense of Microsoft’s requiring WSUS for the successful install of an update retrieved from WIndows Update because I think we are way past attempting to make any sense of MS 2.0/Nadella. @gkarasik: Thanks for the follow-up nice to read you got it sorted. It seems sense, logic and patch conveyancing are a mystery to MS.
Can we get a chart of ms-defcon levels on a weekly interval for the last 3 years to today? Feel free to use the “Older Entries” link at the bottom of each page on the main blog to gather your data.